We are now able to re-program the Meta M9-26 alarm system which is fitted as standard to the Maserati 3200GT. If your fobs have failed or are lost we can reprogram your original alarm complete with two new fobs (or supply the original circuit boards for re-coding) & a new code card. The original side button circuit boards for the Maserati key are no longer made (Maserati dealers may still have then in stock), we can supply Meta equivalents which will work just as well. Simply remove the alarm control box (located behind the rear passenger side cover, remove rear seat and side cover to access the unit - comprehensive instructions found here). The basic price is for a re-coding of the orignal M9-26 with two customer supplied circuit boards, see the options boxes for other choices. 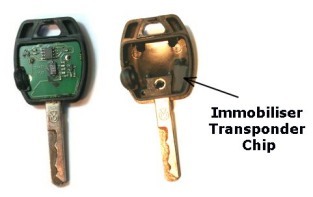 Do not send the ignition keys, using a screwdriver or flat blade simply prise open the fobs to access the circuit boards. The prices include next day Special Delivery within the UK, we offer a 48 hour (working days) reprogram service. Outside the UK contact the office for shipping charges. Please remove the mounting bracket from the body of the alarm box, due to it's weight will greatly add to the cost of postage.